Is there any way to disable the Same-origin policy on Google's Chrome browser? This is strictly for development, not production use. chromium-browser --disable-web-security --user-data-dir="[some directory here]"
The browser will warn you that "you are using an unsupported command line" when it first opens, which you can ignore. Also if you're trying to access local files for dev purposes like AJAX or JSON, you can use this flag too. That should disable the same origin policy and allow you to access local files. You are using an unsupported command-line flag: --disable-web-security. Stability and security will suffer. However you can just ignore that message while developing. The problem with the solution accepted here, in my opinion is that if you already have Chrome open and try to run this it won't work. However, when researching this, I came across a post on Super User, Is it possible to run Chrome with and without web security at the same time?. you can open a new "insecure" instance of Chrome at the same time as you keep your other "secure" browser instances open and working as normal. Important: delete/clear C:/Chrome dev session folder every time when you open a window as second time --disable-web-security is not going to work. So you cannot save your changes and then open it again as a second insecure instance of Chrome with --disable-web-security. Type windows+R or open "Run"
I didn't want to restart Chrome and disable my web security (because I was browsing while developing) and stumbled onto this Chrome extension. Basically it's a little toggle switch to toggle on and off the Allow-Access-Origin-Control check. Works perfectly for me for what I'm doing. EDIT: I tried using the just the other day for another project and it stopped working. Uninstalling and reinstalling the extension fixed it (to reset the defaults). For windows users with Chrome Versions 60.0.3112.78 (the day the solution was tested and worked) and at least until today 19.01.2019 (ver. 71.0.3578.98). You do not need to close any chrome instance. Set it to "C:\Program Files (x86)\Google\Chrome\Application\chrome.exe" --disable-web-security --user-data-dir="C:/ChromeDevSession"
Start chrome and ignore the message that says --disable-web-security is not supported! BEWARE NOT TO USE THIS PARTICULAR BROWSER INSTANCE FOR BROWSING BECAUSE YOU CAN BE HACKED WITH IT! Seems none of above solutions are actually working. The --disable-web-security is no longer supported in recent chrome versions. Allow-Control-Allow-Origin: * - chrome extension partially solved the problem. It works only if your request is using GET method and there's no custom HTTP Header. Otherwise, chrome will send OPTIONS HTTP request as a pre-flight request. If the server doesn't support CORS, it will respond with 404 HTTP status code. The plugin can't modify the response HTTP status code. So chrome will reject this request. There's no way for chrome plugin to modify the response HTTP status code based on current chrome extension API. And you can't do a redirect as well for XHR initiated request. Not sure why Chrome makes developers life so difficult. It blocks all the possible ways to disable XSS security check even for development use which is totally unnecessary. [Updated on Jun 23, 2018] Recent I'm developing an SPA app which need to use corsproxy again. But seem none of the corsproxy on the github can meet my requirement. need it to run inside firewall for security reason. 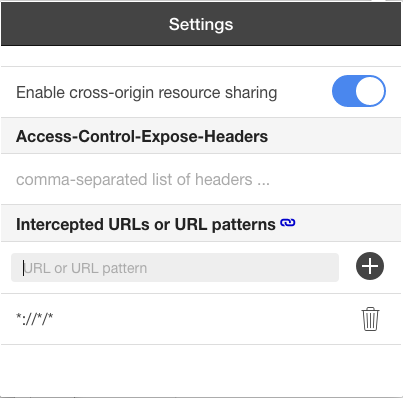 So I can't use https://cors-anywhere.herokuapp.com/. It has to support https as chrome will block no-https ajax request in an https page. I need to run on nodejs. I don't want to maintain another language stack. You can run in http and https mode (by passing the https port number in command line), to run https, you need to generate cert and key and put them in the webroot directory. It supports pre-flight OPTION request as well. For Windows... create a Chrome shortcut on your desktop. (Change the 'C:....\chrome.exe' to where ever your chrome is located). I find the best way to do this is duplicate a Chrome or Chrome Canary shortcut on your windows desktop. 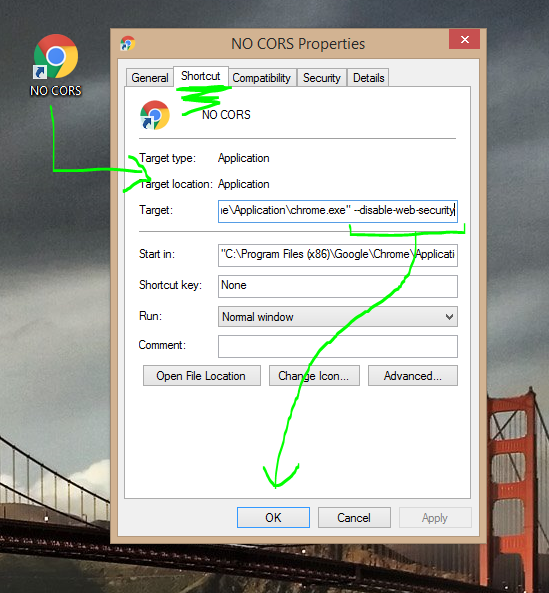 Rename this shortcut to "NO CORS" then edit the properties of that shortcut. in the target add --disable-web-security --user-data-dir="D:/Chrome" to the end of the target path. "C:\Program Files (x86)\Google\Chrome\Application\chrome.exe" --disable-web-security --user-data-dir="D:/Chrome"
It opens another instance of chrome with disabled security and there is no CORS issue anymore. Also, you don't need to close other chrome instances anymore. Change localhost URL to your's one. For Selenium Webdriver, you can have selenium start Chrome with the appropriate arguments (or "switches") in this case. If you are using Google Chrome on Linux, following command works. On Windows 10, the following will work. Following on Ola Karlsson answer, indeed the best way would be to open the unsafe Chrome in a different session. This way you don't need to worry about closing all of the currently opened tabs, and also can continue to surf the web securely with the original Chrome session. These batch files should just work for you on Windows. There is a Chrome extension called CORS Toggle. Click here to access it and add it to Chrome. After adding it, toggle it to the on position to allow cross-domain requests. Then, open command prompt and go to the folder where 'chrome.exe' is. ( for me: 'chrome.exe' is here "C:\Program Files (x86)\Google\Chrome\Application". a new window of chrome will open. Don't do this! You're opening your accounts to attacks. Once you do this any 3rd party site can start issuing requests to other websites, sites that you are logged into. On a Windows PC, use an older version of Chrome and the command will work for all you guys. I downgraded my Chrome to 26 version and it worked. You will get a warning on load of this browser, that it is not secure, just take care with what you browser on it. I tend to rename this new shortcut on the desktop, something in capital, and move it away from my other icons, so it can't be confused for normal Chrome. Try going to this page and disabling the domain security policy for your website domain. Why is an OPTIONS request sent and can I disable it? What is a faster alternative to Python's http.server (or SimpleHTTPServer)? How can I get jQuery to perform a synchronous, rather than asynchronous, Ajax request? Disable/enable an input with jQuery? Can I hide the HTML5 number input’s spin box? Using Chrome's Element Inspector in Print Preview Mode?